Football name and number iron on garment vinyl. High Quality t shirt vinyl (smooth finish). The NAME AND NUMBER come pre-cut (by us) and attached to a heat resistant acetate sheet so you don't have to line up all the letters. Just keep the acetate sheet square (straight) on all four corners and iron on. Then once the letters have stuck to the garment you can peel away the acetate sheet leaving just the name and number printed on your shirt. Easy to follow instructions will be supplied with your order. **I NEED (4) PIECES OF INFO TO COMPLETE YOUR ORDER. 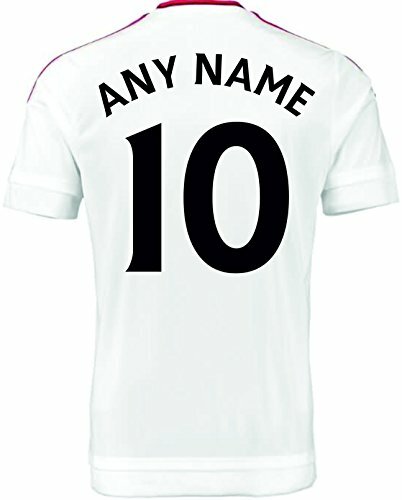 (1) NAME (straight or arched) (2) NUMBER (3) COLOUR lettering (4) SIZE of shirt you are printing (i.e. kids 5-6 or L adults). ***FOOTBALL SHIRT NOT INCLUDED*** As this is a made to measure item custom designed and made specifically to your requirements it cannot be returned because it cannot be re-sold. Please make sure you want the product before you click buy. Thank you.